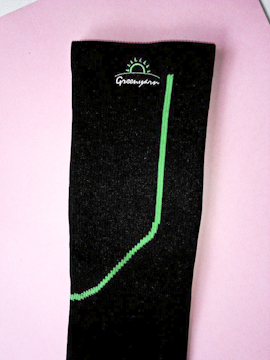 Greenyarn's Eco-fabric knee high graduated compression socks, are designed and rigorously tested by athletes. 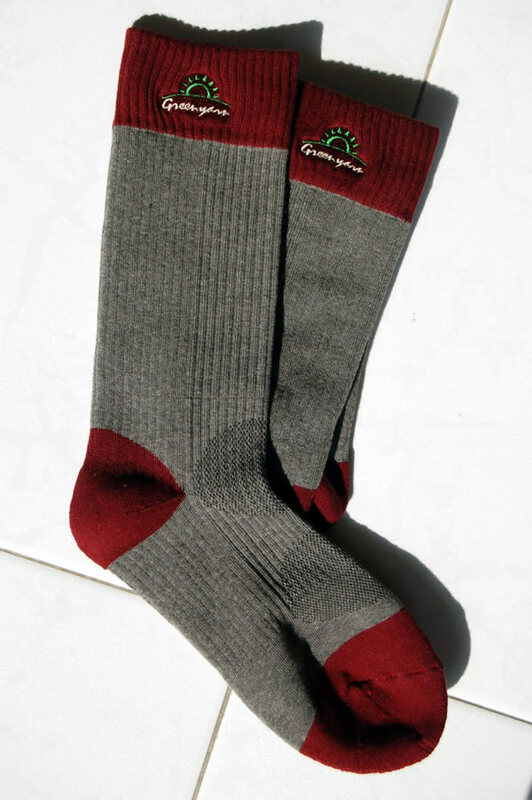 These 200-needle count socks contain Eco-fabric and Lycra making them wicking, soft and comfortable. The densely knitted cushion prevents blisters and foot ulcers. They also have graduated compression. The compression on the calf better targets arteries to help blood ow. Around the ankle, it supports deeper veins. Bio-weave is a highly wicking and quick drying fabric that is embedded with nano-particles of bio-ceramic in its fibers. Bio-ceramic is a fabric embedded with 26 kinds of ceramic mixed with mineral oxides combined together at 1600 degrees centigrade. After cooling, the composite ceramic absorbs and emits far-infrared energy. 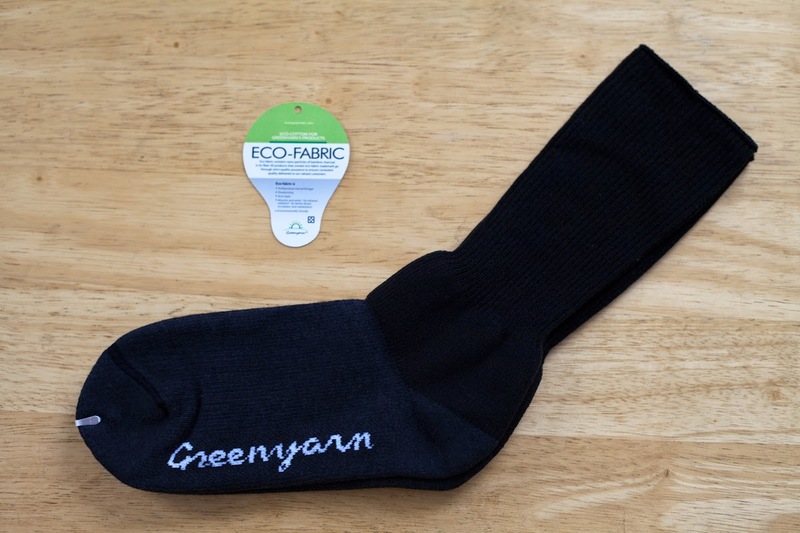 Greenyarn's Eco-fabric travel socks are designed with the help of podiatrists. Featuring what the doctors ordered; little or no cuff, cushioned sole, smooth and flat toes seams, non-constricting tapering compression zones. These travel socks, knitted with our 200-needle count densely knit 3-D technology, the densest in the industry, and made with Eco-fabric, Lycra and acrylic are very soft and comfortable. They are also a very health choice as they wick moisture very well and they offer utmost support and cushioning. 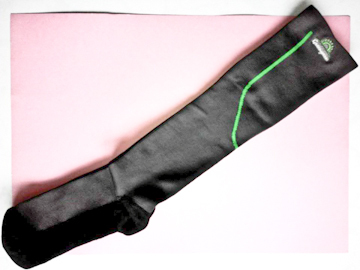 Eco-fabric allows the socks to be antibacterial, deodorizing and emit far infrared energy – promoting blood circulation. The main goal of a pair of diabetic socks is to provide comfort and wick moisture, and these socks perform these tasks very well. 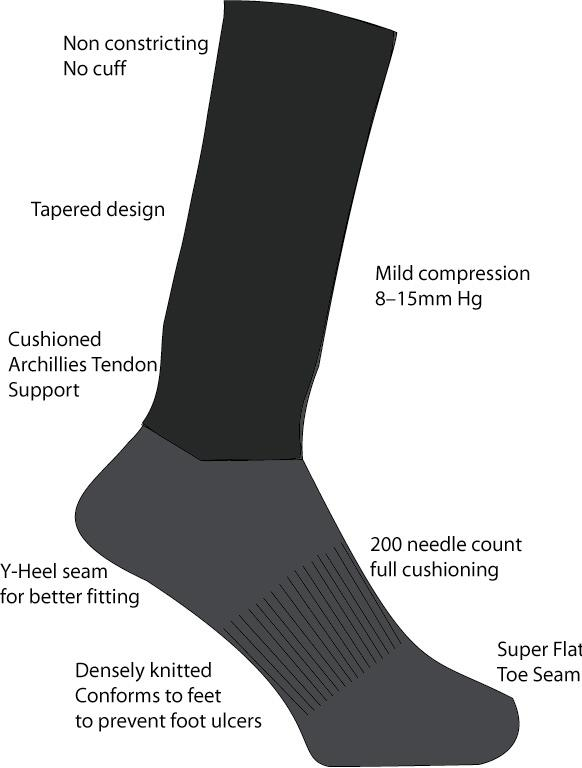 The tapered design of the socks does not constrict blood flow, and the densely knitted cushioning base prevents blisters and foot ulcers.